Chapel Veils: Shouldn't We Avoid Drawing Attention to Ourselves? This question is probably one of the most common to come up when talking about chapel veils: shouldn't we avoid drawing undue attention to ourselves at Mass? Yes, we should never seek to become the object of others' attention, especially at Mass. 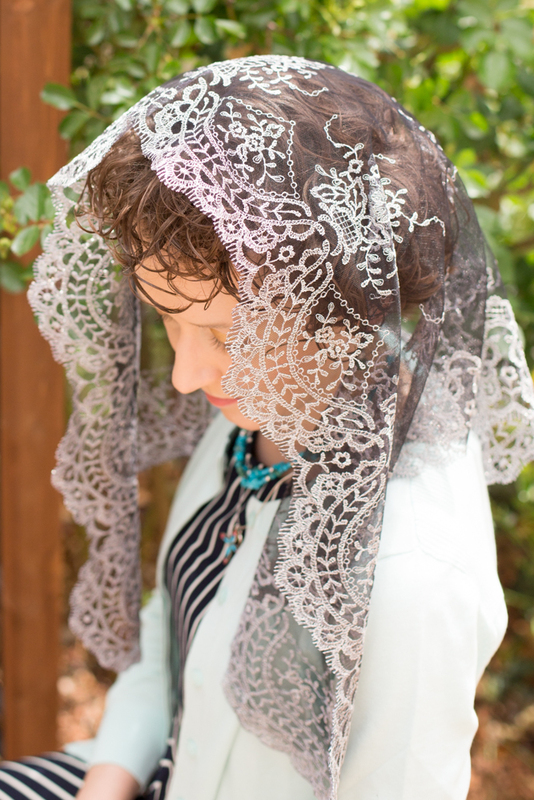 At the same time, as explained in the sermon on the Theological Significance of the Veil, our veils are meant to be a visual statement, "a public proclamation before the Lord that He IS the Lord and that we love Him and that we are ready to obey him." In other words, we shouldn't seek attention for ourselves... but we can, and should, draw attention to God. We can, and should, say: "God is here! He is really here and the whole world needs to come and see Him!" That is exactly what our veils do. Our veils are a visible reminder of an invisible reality, so necessary in a world that only considers real what can be perceived through the senses. So many of our own Catholic brothers and sisters have not been adequately catechized - to the point that a very large percentage doesn't even believe in the Real Presence. Would it really be so bad if someone came up to you, asked you why you wear your veil, and you had a chance to remind them of the transcendent and awe-inspiring work we take part in at every Mass? If you think about it, nuns in habits do stand out in the midst of a world that has renounced God. Indeed, we are all called to be the light of the world - witnesses to Christ's love, which is real and alive in the world. You can be sure that your veil will accomplish this, even without words. Related: The Best Remedy Against Vanity, Vanity, Vanity... Does God Really Need to See a Veil to Recognize Piety?